This photo was taken in Nepal two weeks after a magnitude 7.8 earthquake rocked the nation on April 25, 2015, reducing half of the country to a disaster zone and shocking the world. The dust had by and large settled by the time I pressed the shutter for this picture, and the local people’s lives were settling back to normal. 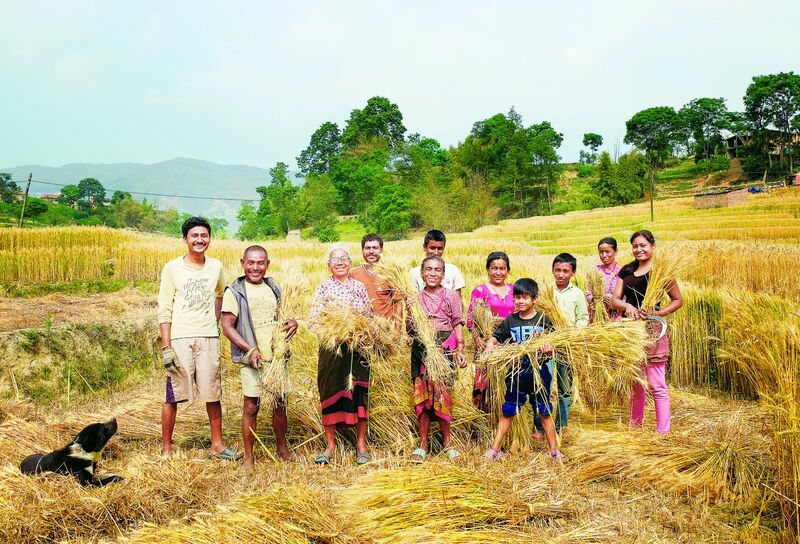 The wheat in Saudol, Kathmandu Valley, had matured, and Cranga Bahadur Makaju (second from left) and his family were busily harvesting in their field. The Makaju family was one of the many households affected by the temblor. They were, however, among the more fortunate in that only their houses were damaged—everyone in the family was safe and sound. Some family members’ homes were too damaged by the quake to be habitable, so for now all members were living in one home, sleeping under the same roof and eating at the same table. Though the quake caused material losses and inconvenience, it had brought the close-knit family even closer. Earthquake or not, life goes on. On this day, amidst small talk and laughter, the family harvested their wheat, forgetting for the moment the hard work involved. The entire family posed for a photo as I clicked my camera, capturing their smiles for timeless memories.